Request for bunk bed plans are among the most frequent "request" type posts on the rec.woodworking newsgroup. I built a set of bunks in 1993 which have held up nicely to the abuses from my kids. Here's what I made and the critical measurements needed to recreate a set. 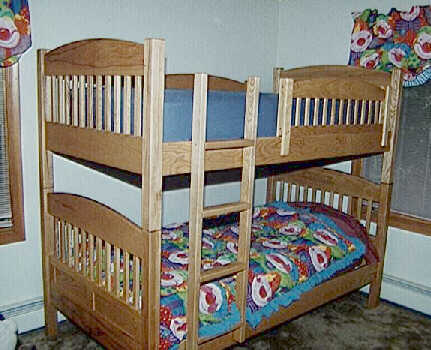 Here is a picture of my bunk beds. Refer to it if the description below is unclear. The design is inspired by an article in Today's Woodworker magazine (issue 18, November/December 1991, Rockler Press, 21801 Industrial Blvd., Rogers, MN 55374-0044; available at The Woodworkers' Store 1-800-279-4441). The wood used is ash, mostly 6/4 stock (1.25 inch thick) which I purchased in bulk form. The finish is Danish Oil (natural) and wax. Total cost was about $200 for the pair (I bought the ash at $1.40/bd ft) and unlike so many commercial bunk beds, it is rock solid. There is one headboard per bed. 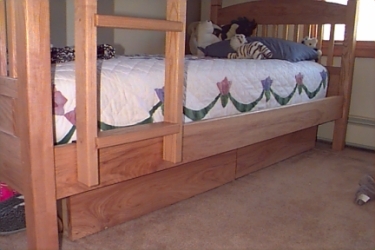 When stacked, both headboards are used on the lower bed. The height of the headboards must therefore be high enough for lower bunk use while retaining enough headroom for the upper bunk. The main posts are 2.5 inches square, made of glued 1.25 inch stock, and 37 inches tall. They are rounded over with a quarter inch rounderover router bit. The posts are seperated by top, middle and lower rails, each 39 inches long. At the top of each post is a 1 inch diameter hole about 1 inch deep. This is used to hold a dowel that connect the upper and lower bunk posts when they are stacked. An ornamental piece can be made to fit into this hole if the beds are not stacked. I made a simple set with 2 inch wood balls and a short 1 inch dowel connector. Each post also holds the female half of metal bed rail fasteners (available at many woodworking stores and mail order firms), one per post. These fasteners are mortised such that they sit flush to the post. Take your time on this part. Additional mortises must also be cut into these mortises to allow the the male fastener hooks room to sit. See the actual fastener is this doesn't make any sense ! Placement of the fasteners is such that when assembled, the side rails will sit 9 inches above ground. All rails are 1.25 inches thick. The bottom rail is 6.25 inches high. It is fastened to the post with a 3 inch tall tenon, 1 inch deep and pinned by a 0.25 inch dowel. The tenon is located at the top end of the rail to limit wood movement to the bottom, away from the rest of the headboard. The bottom of the rail is located 9 inches from the bottom of the posts. The middle rail is 2 inched high. It uses a 0.75 inch tenon, also 1 inch deep. This is not pinned. The bottom of this rail is located 19.25 inches from the bottom thus leaving 4 inches between the middle and bottom rail. The top rail is curved and reaches a maximum height of about 7 inches and a minimum of 4.75 inches on each end. It uses a 2 inch tall tenon also 1 inch deep and is pinned. This tenon is located near the bottom of the rail to allow movement above it. The curve is circular but can be anything desired. The space between the top and middle rail is 10 inches. The space between the bottom and middle rail is filled with two 3/8 inch thick solid flat panels. Their space is defined by three 3x4 inch blocks. Blocks and panels are all held in place by tongues and grooves cut into the middle and lower rails. The blocks are glued in place while the panels are free floating. Finally, the space between the top and middle rail holds 11 slats. Each slat is 1.25x0.75 and rounded over. Slats are space evenly across the 39 inch span. Each slat is held in place by mortise and tenons to the middle and top rails. Avoid using round tenons (such as dowels) as kids will inevitably spin them ! The footboard the same as the headboard except as follows. The posts are 31 inches tall. There is no middle rail or flat panels. The bottoms of each post contains a 1 inch diameter hole for the connecting dowel when the beds are stacked. There is no hole on the top of the posts. The side rails are 5.5 inched wide and 76 inches long. I used 5.5 inches since this was the wood I had on hand but feel free to widen this as desired. The thickness is about 1.125 inches. The actual thickness is the spacing of the ladder hooks used (available from The Woodworkers' Store). Getting the hardware first will ensure a snug fit. The male half of the bed fasteners are mortised into the ends of the rails. Again, take the time to do this right. Final ground clearance is 9 inches. A 1x3/4 ledger strip is screwed and glues onto the inside bottom of the rails. When assembled, four 4x3/4 inch slats will span the opposing ledgers to support the bunky board and mattress. The ladder is 53 inches tall and made of 2.25x1.25 inch stock. The spacing between the ladder stiles is 11.25 inches. There are 4 steps, each of which is dovetailed into the stiles. The steps are 2.625 inches deep, thus stick out the front of the ladder with respect to the stiles. Be sure to take this into account when cutting the dovetails. Ladder hooks are used to hold and fasten the ladder to both the upper and lower side rails. Spacing from step to step is 12 inches. The first step is about 14 inches from the ground when used. I made two guards shaped like the headboard. The two ends of each guard is a sandwich of three pieces of wood. The middle piece is the same thickness as the side rails, 2.125 inches wide and 11.75 inches tall. The other two pieces that form the sandwich are 15.75 inches tall and about 1/2 inch thick. This forms an almost square post that slides over the side rails for a secure fit. The guard is not fastened to the side rails in order to allow easy removal. The top and bottom rails are 39 inches long and 0.75 inches thick. The bottom rail is 2 inches wide while the top is curved. The curve is the same as that of the headboard but peaks at 5 inches at the center and 2.75 inches at the ends. Rails and posts are connected via mortise and tenon. Like the headboard, there are 11 slats. These are 5/8 deep by 1.25 wide and 6 inches tall. Note that the bedding used on my bunk beds consists of a bunky board (about 1.25 inch thick) plus a thick mattress (about 7 inches). You may want to adjust the height of the guard depending on the thickness of your mattress and/or boxspring and/or bunky board. Recently, I added two large drawers to the bottom of the bunk beds to provide much needed storage space. These two picture show the drawers open and fully closed. Wheels can be seen in the second picture. The two drawers have 1 inch thick ash fronts with poplar sides and back. The drawer bottom is 1/4 inch plywood. The drawer sides connect to the front with sliding dovetails with the front overlapping the sides by about an inch on each side. On each drawer side are three large wooden wheels (6 per drawer). The actual wheel diameter is chosen to match the depth of the carpeting. 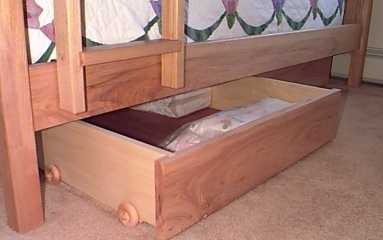 The drawers are sized so that when closed, they are recessed a few inches from the sides of the bed (avoids stubbing toes) as well as from the ends (head/footboards). Using two drawers means each will be rather large, increasing the possibility of sagging. Using three drawers is a possible alternative. I used two drawers but did not cover the entire 76 inch length of the bed rails. The drawers are not suspended in any way, rather they roll within guides hung from the bed's side rails. The guides (two per drawer) are attached to the rails the same way the slats are mounted except that they extend down below the bed. The sides of the drawers bump against these guides to follow a straight course. For extra protection and smoothness, the drawer sides and guides are waxed. The guides also have built-in stops that define how far the drawer can be pushed in. This arrangement of guides and drawers allows maximum flexibility - the drawers may be easily relocated should the beds be unstacked, they do not require drawer hardware nor need to be suspended from the bed rails and face alignment issues.